IMAX 30017 Cayman Boat Drink Bucket by Imax at Blog Free Here. MPN: 30017. Hurry! Limited time offer. Offer valid only while supplies last. Cayman boat drink bucket-serve beverages nautical style with this wood boat serving Bucket in a sea blue finish. Includes removable metal insert. 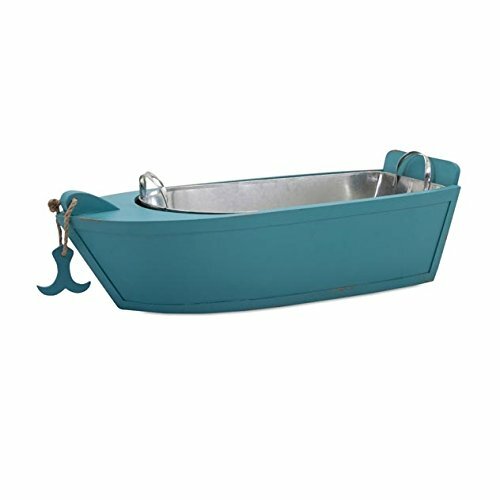 Cayman boat drink bucket-serve beverages nautical style with this wood boat serving Bucket in a sea blue finish. Includes removable metal insert. Finished by hand with exemplary detail, there may be slight variations in size, color and texture. These variations are a reflection of the authenticity of the piece and signal the originality of the artisan. Care instructions: dust with a clean, dry cloth. Brought to you by IMAX- one source, a world of choices. If you have any questions about this product by Imax, contact us by completing and submitting the form below. If you are looking for a specif part number, please include it with your message.